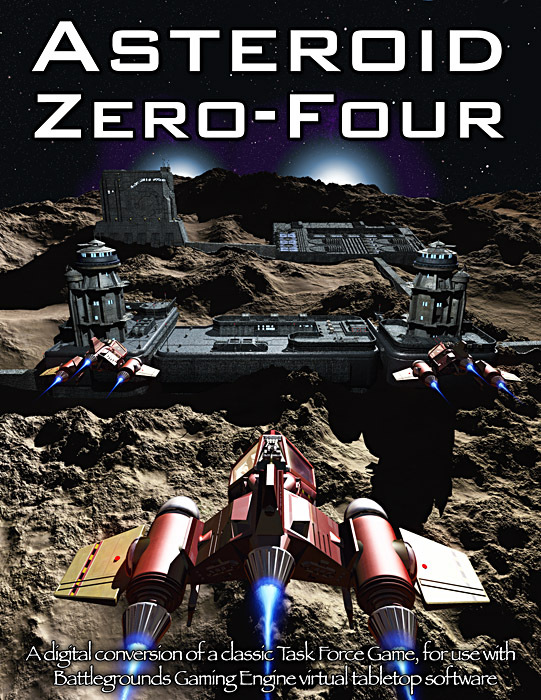 The “Asteroid Zero-Four” Game Box is an updated and enhanced digital version of a long-out-of-print game. 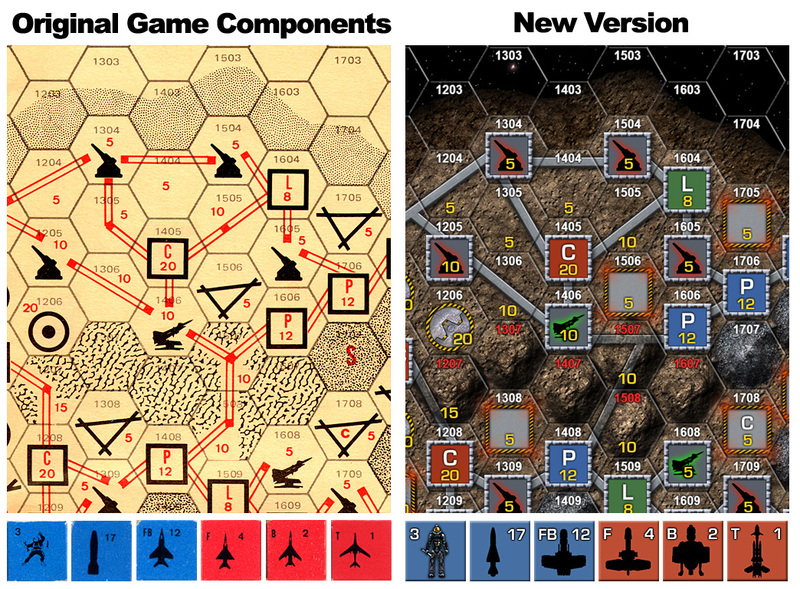 It is being re-published for use with BGE with permission from the original designer (and current copyright holder), Stephen V. Cole (who is most known for his highly successful “Star Fleet Battles” games and expansions). Originally published in 1979 by Task Force Games as one of their Pocket Game series, “Asteroid Zero-Four” is a two-player science-fiction game portraying a nuclear war between two mining bases in the asteroid belt of our solar system. Each player commands an asteroid base equipped with laser turrets, command bunkers, ore processing plants, landing pads, and defensive missile launchers. Each player also has spacecraft, missiles, and an arsenal of nuclear ordinance at their disposal to attack the enemy asteroid base with. Spacecraft can be used either as defensive interceptors or to deliver nuclear warheads. Each nuclear warhead that impacts an asteroid is calculated for yield, burst height and blast radius; resulting in damage to the various installations on the asteroids. After each attack, any surviving spacecraft return to their base for repairs and refueling. Engineering teams on each base attempt to repair damaged structures on the asteroid to keep key systems operational, but are themselves vulnerable to nuclear and conventional explosions. To win, you must destroy or disable the enemy mining operations in a fixed number of turns, while trying to keep your opponent from doing the same to you. Each player is therefore simultaneously concerned with offensive and defensive options. I invite everyone to download the first ten pages of the 42-page rulebook to learn more details about the game and to see if it peaks your interest. Here’s another preview, to clearly demonstrate that this is not simply a case of scanning in the original game components. So what exactly is a “Game Box”? Game Boxes for BGE are simply a distribution package, which includes an artpack containing the playing board (generally a map), digital tokens (in lieu of cardboard counters or plastic minis), and the game’s charts and tables. Game Boxes will also include the following files: dice macros, Game Files and Deployment files, custom Turn Sequencer settings and Preferences, a rulebook in PDF format (searchable), and installation instructions. In short, everything needed to play the game if you already have at least one Gamer Client license (BGE v1.5 or higher). For multiplayer games, the extra players do not need to purchase the Game Box, but they will need a Gamer Client of their own, or they can use the free BGE Demo if the person hosting the game session has enough free Player Slots available for them to use. I am also including templates for creating your own custom game tokens that match the official game tokens (very handy for players that love the game and would like to expand it with their own units).